On the sidebar is a list of CLI's Corporate Programs including Leadership Excellence, Team Success, Performance Management and so on. We call these programs "The Big 8" because they are the most sought after programs. CLI's experience is that standard industry programs lack the ability to truly assist Leaders and Employees to create permanent positive change in habits and behaviours. Therefore, organizations spend billions of dollars worldwide on training programs that rarely provide a solid return on their investment. CLI's research and development of results-oriented tools has created a paradigm shift in the training industry. As a Leader, you can expect a high rate of return on your investment from our programs. 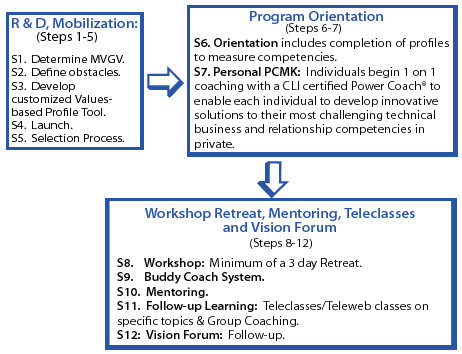 CLI has recognized that by using the typical approach you see below for each of The Big 8 programs, the participants will experience permanent positive changes on the challenges and goals they choose to work on. The way the process is designed. The Science of Mind-Kinetics® is used in each and every program to assure permanent positive change.